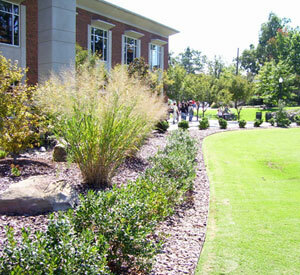 Professional landscape design and installation in harmony with the Earth. Welcome to New Earth Designs, Inc. – a design/build Landscape Contractor serving discerning individuals and companies throughout the Triad and beyond. Since our beginning in 1980, we have created hundreds of superior gardens and landscapes thoughtfully serving the needs of each individual client. We work with residential and commercial customers with landscaping projects ranging from small patio gardens to large multi-family and institutional developments. New Earth Designs, Inc. is committed to providing innovative and quality landscape construction through thoughtful design and superior landscaping techniques. Our company is a collective group of trained, experienced horticulturists with extensive backgrounds in landscaping and design. We seek long-term relations with our clients in order to conceive, create, and successfully manage beautiful gardens.And, yes, we are sensitive to today’s tough urban environments and our need for thoughtful preservation and environmentally friendly and sustainable landscape development. Our friendly staff includes degreed landscape designers, N. C. Certified Landscape Technicians, N. C. Certified Pesticide Applicators, N. C. Certified Plant Professionals, ICPI Certified Concrete Paver Installers, stone masons, carpenters, equipment operators, and plantsmen. All senior staff members have at least 20 years experience in the landscaping industry. Thank you for your interest in our website. We look forward to hearing from you and beginning the journey of discovering exciting ways to create your perfect outdoor living space.